“Have Your #Hugot Harvested At This Diwata-Owned Cafe” will be in Kathang Haka: The Big Book of Fake News. “First Play For and By Tikbalang Triggers Uproar on Opening Night,” Expanded Horizons, issue 58. My week 6 Clarion story “Blushing Blue” can be found in Broad Knowledge: 35 Women Up to No Good. 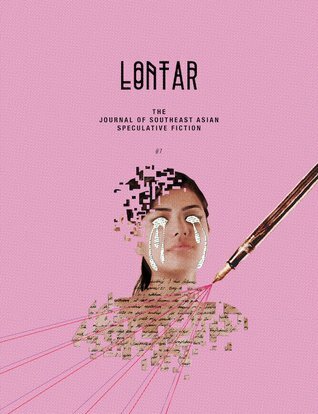 My week 3 Clarion story “Song of the Mango” can be found in the double-sized tenth and final issue of Lontar: The Journal of Southeast Asian Speculative Fiction. I’m very sad to see this journal go, but also very glad that this story–of which I wrote a novella version–made it to its last issue. Available in print at all Kinokuniya stores, as well as an e-book over at Weightless Books. My first place-winning novelette “Odd and Ugly” can be found in L. Ron Hubbard Presents the Writers of the Future, vol. 34. Available in print at all Barnes & Nobles stores, and as an e-book on Amazon. If you are in the Philippines and would like a print copy, drop me a line at hello@vidacruz.org and I’ll see about getting you a copy. My week 2 Clarion story, “Ink: A Love Story,” can be found in Lontar: The Journal of Southeast Asian Speculative Fiction, vol. 7. That cover was based on my story, too! Available in print at all Kinokuniya stores, as well as an e-book over at Weightless Books. I’ve always wanted to sell a story to these guys, and now I have with “First play for and by tikbalang triggers uproar on opening night.” Now available at all eBook retailers since October 6, 2014. My story “How the Jungle Got Its Spirit Guardian” can be found here. Released on October 3, 2014 by FableCroft Publishing, available on Amazon as print and eBook. A tighter version of “To Megan, with Half My Heart” made it here. The anthology of my batch of the 51st SUNWW, which was laid out by my boyfriend and edited by me. Of which I still don’t have a copy. My 100-word story “An Author Takes a Wife” can be found here. Where I wrote about comic artists, my travels, exercise routines, cemeteries, Philippine monsters, book and movie reviews, other Lifestyle events, and occasionally politics, for a living.